← Aqua jogging, feel the burn! Splash your friend! On Saturday, the day before we left for Whidbey Island, it started to snow. After an unusually mild winter, I found the timing to be HILARIOUS. As we drove down toward Deception Pass, the snow just accumulated more and more. Luckily, by the time we reached Oak Harbor, it was just a rainy day and any white stuff had melted away. We kicked around for a bit, going to Safeway to buy the necessities (bananas, peanut butter…) and then to Windjammer Park (the race start) to play on the windy beach and at one of the most expansive playgrounds I’ve ever seen. My daughter was pretty excited about that part! We even got a decent window of sun. I got virtually no sleep the night before the race, but I was nonchalant about it. I intentionally tried to sleep as much as possible in the nights leading up to race weekend knowing I would probably experience a lot of nervous energy before the race. 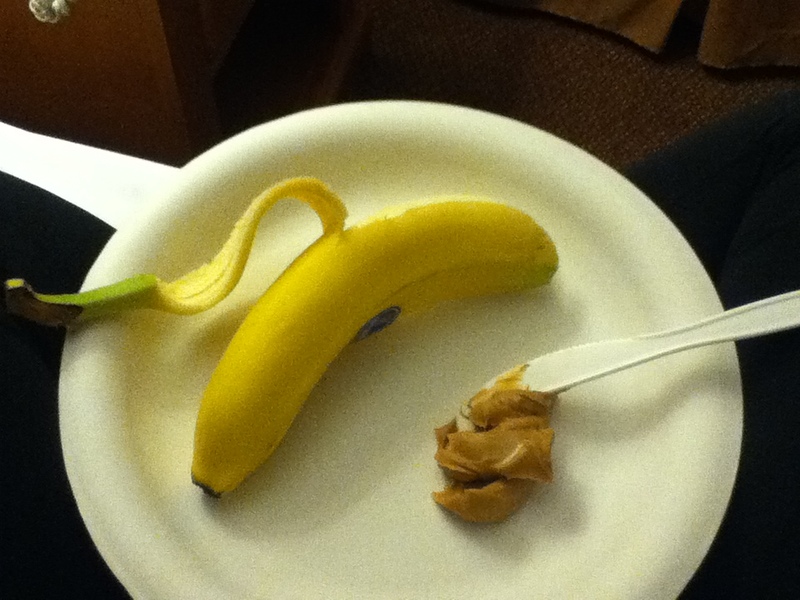 In the morning, I got up, made coffee, and ate all of my special race day foods. At around 7:30, my husband drove me and my running buddy to the start. We huddled in the heated tent and I made many trips to the port-o-potty because I was really well hydrated and also didn’t want to pee during the race. At 8:05 we started lining up, and I put myself right behind the 2:10 pacer figuring I would run between him and the 2:20 pacer to meet my goal of 2:15. At 8:15 we were off, and almost simultaneously, the downpour began. This half was very different for me in that it went by quickly. I was blissfully in the zone for many of the miles and didn’t really pay attention to the markers until around Mile 9. Even with the rolling hills in the first half of the race, I was able to stay ahead of the 2:10 pacer and continue steadily without walking. In fact, there was only one time that I walked briefly, and that was when I needed to eat my GU. 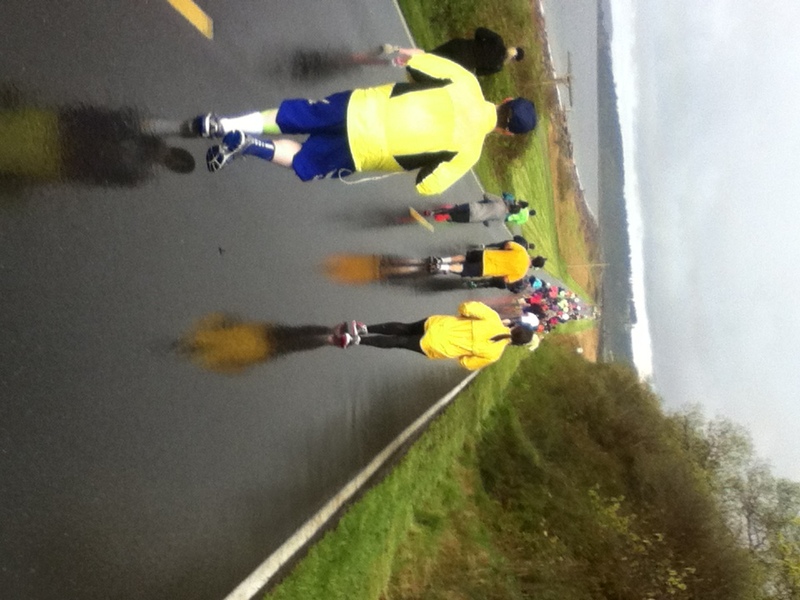 When we got to about Mile 4, we started in on the trails, and were a bit more covered from the rain. I love how much the route went on trails, through woods, and along the water. It was truly a beautiful tour of that part of the island. The middle part of the race took us through the Naval Base, which made for interesting scenery. It really is a city within a city. Miles 6-7 were on this beautiful strip of road between the coast on the left side and a shallow tide pool on the right. 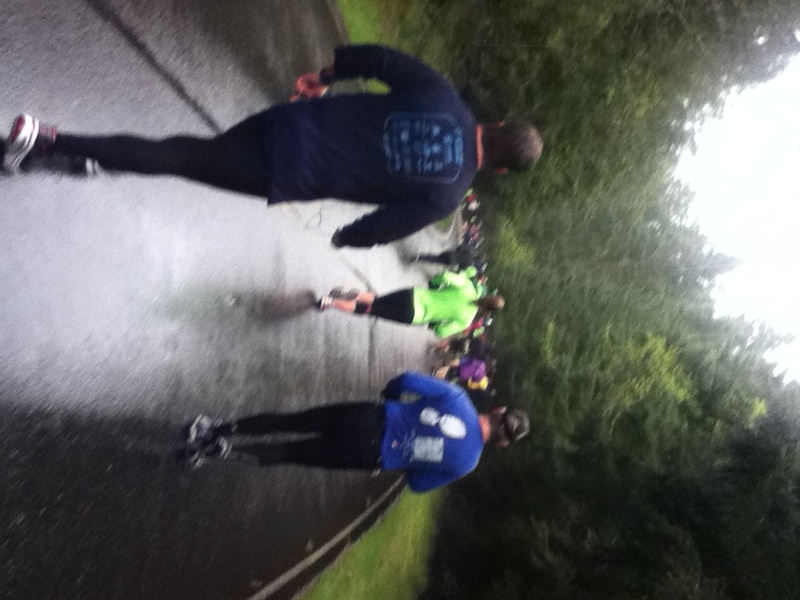 At this point, the rain let-up quite a bit, but my feet were getting wet from large puddles on the course. The route was a lopsided figure eight, so at around Mile 9 we actually bisected the starting area and went for another smaller loop through trails and roads on the other side of the park. The last four miles were very hilly and difficult. The last steep uphill at Mile 11 was the only time I saw the 2:10 pacer in front of me. I did my best not to get frustrated, I fueled again with some GU, and I reminded myself that the goal was primarily to finish, and secondarily to finish under 2:15. The last mile, which is usually all guts for me, was surprisingly fun because it was almost entirely downhill. I was very happy to finish at a time that was below my goal time by quite a few minutes. Ready for a hot shower and dry clothes. Of course once I got to the end of the race, the clouds parted and the sun started shining. We enjoyed a beautiful drive home and then I spent the rest of the afternoon playing out in the yard and tending to some gardening. 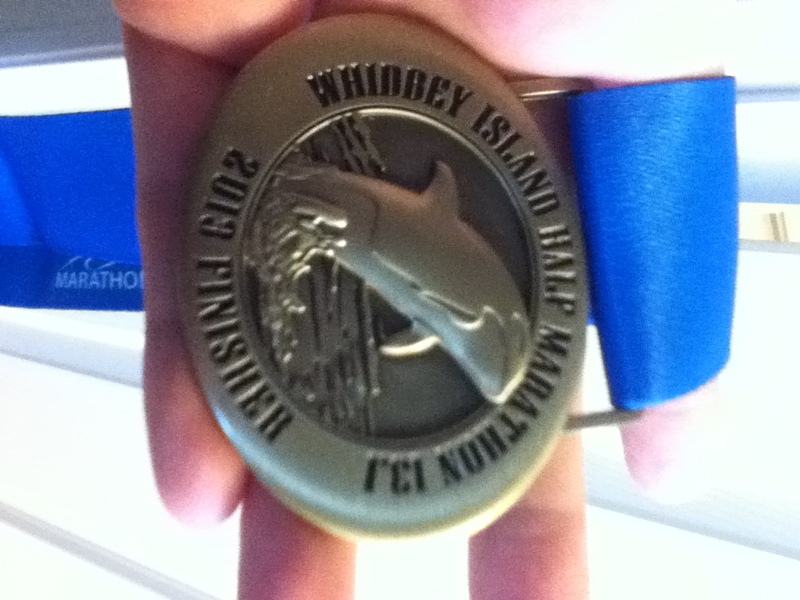 This morning I am a little sore, but nowhere near as stiff as I was after my first few half marathons. When I finished yesterday, I could have gone a few more miles, and that made me realize that my body is capable of longer runs–that the marathon goal is not unrealistic. 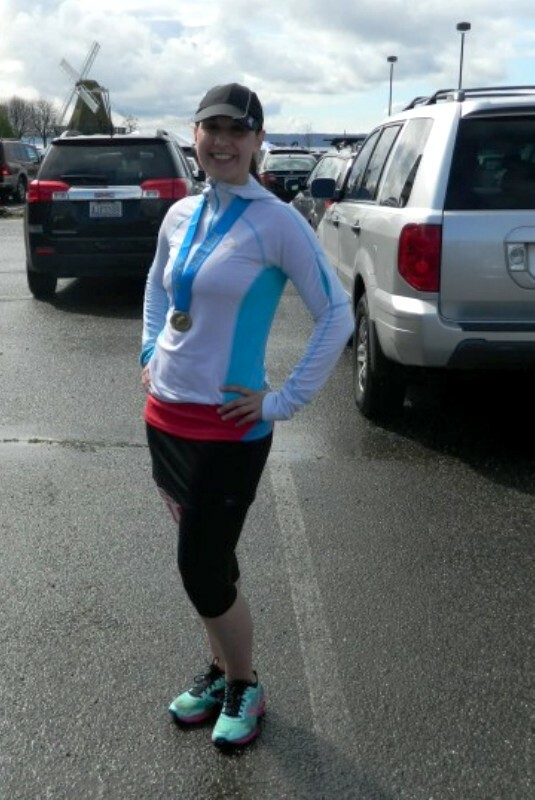 Additionally, I had so much FUN running the race yesterday–even during the challenging hills and last few miles! I jokingly told my running buddy before the race that I was excited for the day that a half marathon would be my fun run. While half marathons still require a lot of mental and physical effort from my body, they are becoming more manageable and enjoyable. I was a bit sad to finish this half marathon, but I know I will definitely run this race again because it was so beautiful and I have great memories from it. I am very glad I have the Rock’n’Roll Portland lined up for next month–something to continue working toward! Dare I try to shave more time off my finish? ?